Inspired by one of the noisiest cities in the world, musician Craig Shepard has composed a piece of music so still and spacious that most of its listeners didn't even realize when it was being performed. That's because Shepard, 38, performed the sonic portion of On Foot, his multimedia collaboration with partner Beth O'Brien, 37, on the streets of Brooklyn, as buses and taxis and pedestrians passed in noisy waves. Even if the masses of scurrying Brooklynites did notice the guy on the corner with the trumpet to his mouth, they probably just thought him one of the city's countless eccentrics. Had they listened more closely to the muted sounds, minding the gaps (as it were) between the notes, they might have tuned in to Shepard's exploration of the ways in which silence and stillness fit into the modern urban landscape. As Shepard played, O'Brien documented his performances in photos and video; the result of this audiovisual collaboration is On Foot: Brooklyn, which the artists will present at Middlebury College's Axinn Center at Starr Library this Friday. This new work is both a summary and a partly improvisational rearrangement of the various components and intentions of the multifaceted original piece. One of the people responsible for bringing On Foot: Brooklyn to Middlebury College is associate professor of philosophy Kareem Khalifa, who has known Shepard since childhood. "[Shepard] is my longest intellectual and musical collaborator," Khalifa writes in an email, "and I've learned so much from him that I thought others could learn a lot from him, too." On Foot itself is a strongly site-specific artwork. Shepard not only performed it outdoors on numerous Brooklyn streets but was inspired to compose it on his many walks through that city's diverse neighborhoods. Each week for 13 weeks in 2012, Shepard set out on a lengthy walk from his home in the Greenpoint neighborhood to a different quadrant of the city, allowing sonic ideas to mix and brew in his head. 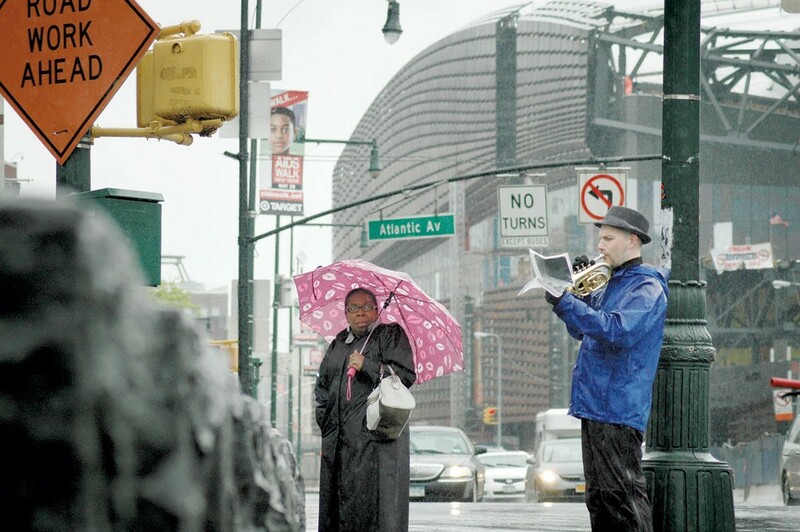 Each Sunday, he'd lead a silent walk to another site in Brooklyn to perform that week's composition in a public space. Through his emailing list, various websites and word of mouth, he invited members of the public to walk along with him, but only if they agreed to turn off their phones and stroll in silence. The piece isn't about silence per se, insists Shepard in a phone conversation from Brooklyn. "What's been more interesting for me over the years is thinking about stillness," he says. "That's an experience that happens in your mind. An actual consciousness." Wasn't it awkward, though, to walk in silence through a noisy city with a group of strangers? Yes, a little, Shepard admits, but, as he says, "The experience of silence was something that happened together. When we walked together, the silence came from the commitment that we had to each other." O'Brien would accompany those walks on her bicycle, shooting the photos and videos that constitute the visual portion of On Foot: Brooklyn. "I definitely took inspiration from the way that Craig works with silence in the way that I made the videos," she says. "The overall structure of the video has spaces or sections of just black: the visual equivalent of silence." A book of 76 of O'Brien's photos from the project is slated for publication this summer. In adapting their hyperlocal artwork for performance in other venues, O'Brien and Shepard came up with an unusual strategy. Projected video stills will be juxtaposed with several types of audio: Shepard's compositions, performed live with varying instrumentation (with the help of at least one Middlebury student); "field recordings" of the ambient sounds of the sites of his performances; and silence. "The idea of our performance is not to give you an idea of what it would be like to be there," O'Brien says, "but to take different aspects of what it's like to be there and present them in this partial, somewhat disjointed way. Sort of like a memory of a sound that happened in that space." On his perambulations, Shepard says, he learned not only about the diversity of Brooklyn (and the surprisingly suburban vibes of many of its neighborhoods) but about the functioning of his own internal mapping system. To use the subway in New York City, he says, "is almost like teleporting." Eschewing vehicular transit in favor of foot power resulted in a refinement of Shepard's ability to orient himself in the city, he says. With On Foot: Brooklyn, Shepard and O'Brien hope to stimulate thought in their audience members and to inspire them. "A good result ... would be for [a viewer] to get the energy to do something that they want to do in their own life," Shepard says. "We offer this [performance] up as an invitation to consider that this is what we did with our lives for three months. What might you do with yours?"